PLEASE DO NOT SEND ANY EMAILS WITH NEGOTIATIONS OR LESS-PRICE OFFERS! Arkadi Pavliuk was born in 1925 and worked at the Ukrainian regional centre Vinnitsa. He was member of the Union of Ukrainian Artists and took part in numerous regional, republican and all-union exhibitions. Condition: In good overall condition. Measurements: UNFRAMED:40,0x63,2cm/15,7x24,9in FRAMED: 49,1x72,4cm/19,3x28,5in. Object Type: framed oil painting. Inscription: signed in Cyrillic, dated (19)66. Creator Dates: 1925-was active in Vinnitsa. 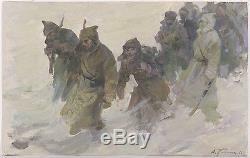 Themes: RUSSIAN UKRAINIAN WINTER MILITARIAN SOLDIER RED ARMY MILITARY ARMY RUSSIAN CIVIL WAR WAR. Sometimes more, depending on destination. PLEASE NOTE: We are NOT professional packers! The item "Russian Civil War, by Arkadi Pavliuk (b. 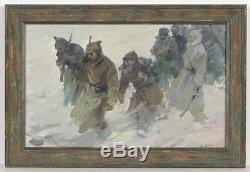 1925), Oil Painting, 1966" is in sale since Thursday, March 20, 2014.